The Downey Police Department is pleased to announce the recruitment of individuals to participate in our Department’s 19th Citizens Academy. The Citizens Academy will begin on Wednesday, January 16, 2019 and conclude on Wednesday, March 20, 2019. The classes will be held on Wednesday evenings and are scheduled to be three hours in length, from 6:00 p.m. to 9:00 p.m. 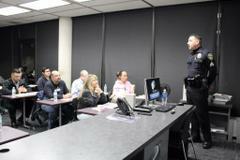 The ten-week program is designed to expose members of the business and residential community, 18-years and older, to various aspects of law enforcement and the day-to-day operations of the Downey Police Department. In order to ensure personalized instruction for each participant, the class size will be limited to 20 individuals. If you wish to apply, contact Neighborhood Watch Coordinator, Jenny Aguirre at jaguirre@downeyca.org or (562) 904-2374 or Sergeant Terry Goeckner at tgoeckner@downeyca.org or (562) 904-2385.